External Affairs Minister (EAM) Sushma Swaraj on Monday said that the Indian Ocean is a central component of a free and fair Indo-Pacific region, adding that the country has a vision of collective action and cooperation for realising the true potential of the region. Inaugurating the third Indian Ocean conference here, Swaraj said, "The Indian Ocean was known as 'Ratnakali' or ocean of treasures'. Our vision of the region is of collective cooperation and coordination. Therefore, nurturing a climate of peace and stability is an important priority for our foreign policy. We have to commit to the idea of peaceful co-existence." Reiterating Prime Minister Narendra Modi's vision of a free and inclusive Indo-Pacific region, Swaraj insisted that it is important to build an overarching vision for the region. Swaraj stressed that the countries which come under the Indo-Pacific region should strive to work to ensure peace and prosperity are attained in the Indian Ocean. She further underscored that over the years, India's approach to the region matured into a broader strategic engagement with the help of ASEAN. "We see ASEAN as central to regional maritime architecture. This was recognised by leaders during the ASEAN-India Commemorative Summit in January. In the Delhi Dialogue, we reiterated the importance of maintaining and promoting peace, stability, maritime safety, security and freedom of navigation in the region," she continued. 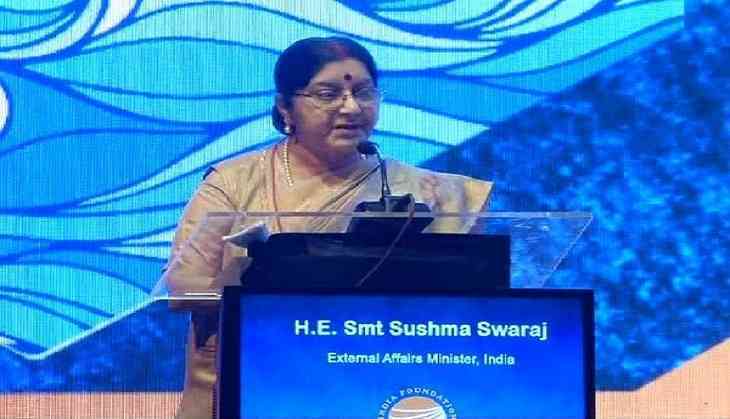 Terming the Indian Ocean as a centre of 'emerging age of Asia', Swaraj stated that the economic importance of the ocean maintains a key strategic importance while adding that the Indo-Pacific region is host to some of the world's busiest waterways. Talking about the maritime challenges in the region, Swaraj elucidated, "Security is an old and compassing concept and includes traditional, non-traditional and newly emerging threats. These include maritime terrorism, smuggling, transnational crimes, drug trafficking, illegal undeported and unregulated fishing, piracy and unregulation of private maritime security companies and proliferation of sensitive items. This is further compounded by natural disasters, climate change and oil spills, which our region is highly prone to." The EAM said that such diverse nature of challenges requires effective partnerships at both regional and multilateral level. Stressing that India considers Indian-Ocean Rim Association (IORA) as an instrument for achieving peace and security in the region, Swaraj continued, "We are supportive of the invigoration of these activities including the blue economy and renewable energy. The focus of IORA on maritime safety and security promotes a sheer understanding of maritime issues. It helps to develop a cooperative mechanism. We will enhance a regional HADR (Humanitarian Assistance And Disaster Relief) capacity in cases of natural disasters and crisis. We share a common vision for Indo-Pacific (region)." Reiterating Prime Minister Modi's 'SAGAR' vision, which stands for Security and Growth for All in the Region, Swaraj listed three approaches saying, "Projects to promote hinterland linkages and structural regional connectivity, making South Asia to South-East Asia under the Act East Policy and and the Gulf under the Think West Policy, and lastly, playing an active n constructive role in strategic maritime security." Swaraj underscored that India and Vietnam shared all concerns of the maritime issues and agreed to cooperate in the domain, including anti-piracy, security of sea lanes and exchanging of white shipping information. Swaraj, who is currently on a five-day visit to Vietnam and Cambodia, further went on to say that a precisive and a collective approach is required to develop the Indo-Pacific region to its true potential. Stressing that the region cannot be solely a growth engine for others, Swaraj said, "It is to be a community of ideas and commitments. (We need to ensure) the commitment to the ideas of rule-based orders, equality under the international law, peaceful resolution of disputes and equitable distribution of benefits of distribution."